In classrooms across the nation, students spend untold hours sitting at desks and tables working on their lessons or listening to their teachers. That lack of movement might not have been a concern years ago, when children’s time away from school typically was spent outdoors playing and exercising. But as children spend more time in front of a video screen than on a ball field, greater numbers of them are becoming overweight. The time they are tethered to their classroom chairs and desks only accentuates their sedentary habits, and the prolonged lack of body stimulation can make it harder for them to concentrate. The right kind of furnishings in a classroom won’t by themselves turn a generation of inactive, out-of-shape students into physically fit health buffs, but schools can provide seats, desks and chairs that are better suited to keeping students’ bodies active and their minds alert. No one offers a greater variety of School furniture, Church furniture, or Early Childhood furniture than Worthington Direct. Our sales staff is extremely knowledgeable and possesses an average of 10 or more years experience in the educational industry. If you have questions about which size furniture your students need or which style furniture best suit your learing environment, visit today www.worthingtondirect.com. Measuring up If children are getting bigger, the classroom furniture they use should get bigger, too. In some cases, a child’s growth spurt can make a right-sized desk a confining and uncomfortable place. If a chair or desk is too small for a student, his or her discomfort could make it difficult for them to perform in the classroom. “The kids are getting bigger,” says Celestine Hart, director of purchasing for the Lansing (Mich.) school district. “I have seen where we’ve ordered furniture advertised for kindergarten and first grade not being large enough. Now we are looking a little closer and measuring to make sure what we are getting is big enough.” The size issue also comes up at the high school level, where the desks available aren’t a good match for some beefed-up football players and other large students. “Some of these students don’t fit into some of this furniture,” says Laura Sarelis, an interior designer with Kingscott Architects in Kalamazoo, Mich. “They aren’t children anymore. They’re full-grown men.” The solution to accommodate these students is more flexible classroom furniture. Instead of attached desk-chair combinations, many schools are using chairs that are separate from desks or tables. 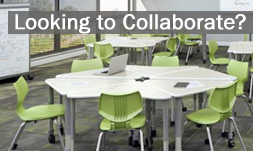 Adjustable desks and tables can be matched to the size of a particular student. Instructional benefits Furnishings that enable teachers to explore different methods of instruction can enhance a student’s learning experience and provide more movement and stimulation than a day stuck in a desk and chair. That means furniture that is flexible — tables that can shift from sitting to standing height; desk surfaces that can be placed at different heights and angles; and tables, desks and chairs on casters so they can be moved easily and quickly. Price is a critical component of school furniture purchases, but the staff members who are buying the chairs and desks should be weighing more than just price. In Lansing, Hart says the purchasing department meets with staff members to determine what kinds of furnishing would create a better classroom environment.